The comic that served as an intro for the PS3 version of Mass Effect 2 finally comes to the 360. Comics based on videogames tend to be ... well, let's not mince words. They tend to be dreadful. But some of the ones based on EA's games (I'm looking at you, Dead Space) have actually been pretty great. Now, Xbox gamers have the opportunity to watch the motion comic of Mass Effect 2: Genesis. The comic is a collaboration between BioWare and Dark Horse Comics. The comic is being billed as a "15 minute interactive experience allows you to make the key choices of Mass Effect 1. This retelling will also let you have those choices reflected during Mass Effect 2." 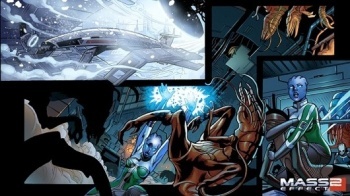 The comic was originally created to introduce PS3 players to the Mass Effect universe, now it's an add-on Mass Effect 2. The comic is currently going for 320 Microsoft Points ($4). If you're looking to play Mass Effect 2 without slogging through all the backstory of the first game, this isn't a bad way to do it.